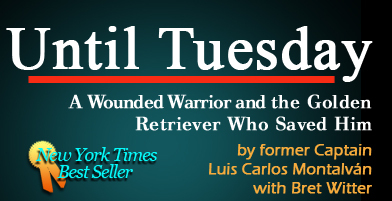 "When Captain Luis Montalvan returned home from his second tour of duty in Iraq, he looked like a poster boy for combat disability: This brave warrior returned with a Purple Heart and two Bronze Stars, but also with a traumatic brain injury, stab wounds, and three broken vertebrae. Even worse than the visible injuries were the wounds inside. Before long, his crippling PTSD fears took him to the very threshold of suicide. 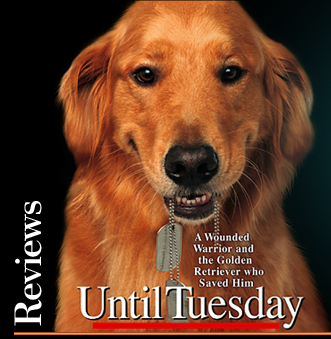 Then a most improbable rescuer arrives: Tuesday, the golden retriever who graces this book's cover, moved, tail wagging, into Luis' home as a service animal. His exuberant playfulness and devoted companionship accomplished what cadres of health professionals had not been able to achieve. Montalvan's first person account of how his warm-snouted, four-footed friend saved his life seems to have deeply touched every reader. If this book doesn't make you cry, I don't want to know you."